Can anyone supply more information about this photograph and the people in it? 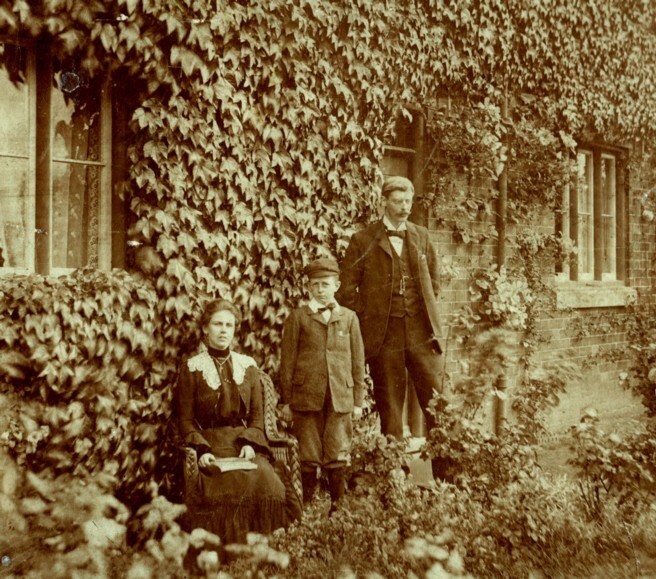 Mrs Webster, who lives at the Old School House, Grantham Road, has let us copy this photograph which shows a family group at the School House during the Edwardian era. There is no label on the photograph, other than the name of the photographer, Edwin Rey. Wilfred J Barrand, 7, their nephew, born in Hull. It is most likely that these are the three people seen in the photograph. In the Book of Bottesford, Michael Honeybone records that Mr Collett was in charge of the village school at the end of the 19th Century (p.90), and then that in 1902 he had written How to Spend a Holiday in the Vale of Belvoir which was reprinted by Harrison’s of Grantham as A Guide to Belvoir, Bottesford and District (p.105). Honeybone also reproduced (p.107) a description of Bottesford during the First World War, written by Mrs Jordan, nee Smith, who states that Mr Collett (‘the Old Boss’) was still headmaster. This page was added on 23/10/2007. Thank you very much for contacting us with this information. Please do let us know if your research uncovers other such interesting material. We were very interested to read your comment. As you probably know, the Barrand family ran The Bull Inn, Bottesford, between about 1860 until some time in the1870s. The 1861 census gives the landlord of The Bull Inn as William Barrand, Licensed Victualler from Stoke in Lincolnshire. His wife was a Bottesford woman, Ann Norris aged 37.They had two daughters at home, twelve-year-old Mary and five-year-old Sarah.The Parish Register tells us that a son, Robert Norris Barrand, was born on 1864, but died aged 2 in July 1866. The Barrands stayed on at The Bull, they were still there when the 1871 census was taken. In addition to being Licensed Victualler, William was also listed as ‘owner of 10 acres’. While daughter Mary was no longer with them, a son, William, 23, was back at home and in addition to Sarah they had another daughter, nine-year-old Eliza. Can you tell us how Wilfred Barrand was related to this branch of the Barrand family? We have been wondering what the exact connection between the Collett and the Barrand families was. Perhaps he was Mary Collett’s nephew and she was related to the Barrand or the Palmer family. Please get in touch again if you come up with any further information.